I published some time ago a plugin for Sublime that makes my life easier when working in node.js. It allows me to introduce require calls by searching for the files in the current folder. I press ⌘⇧m, then I search the file/module I want to require and it automatically calculates the relative path. Also I can use it to introduce require to native modules, or the modules I've installed on my node_modules folder. You can install it with the Sublime Package Control, source code is here. I would like to introduce a tool we have built to demo Auth0. mdocs.io is a free and opensource tool to collaborative write documents. You can think of it like google docs with markdown. It uses the technique called operational transformation to allows users to edit a document simultaneously. 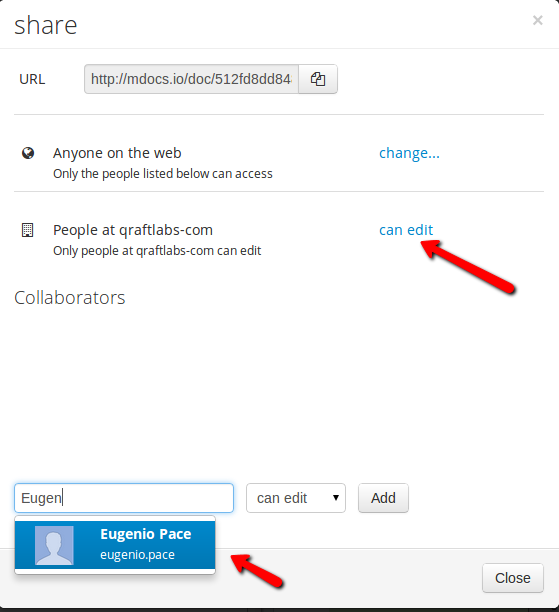 Every document is private at the beginning and you can easily share it to your peers or make it publicly available. Login with google through OAuth, select contacts, etc. is basic stuff and there are lot of tools to this kind of thing on every platform. You can use mdocs in solo mode with your @gmail.com account. But we wanted to use mdocs just as we use google docs, this means being able to share documents across the company or group of people. So, when you go to mdocs.io you will see an option to connect mdocs to your company either by using google apps, office365 or adfs. In order to complete this process you will need to involve an admin of the domain. If you are no the admin, you can follow the procedure which is about 2 clicks and send the link at the end of the process to your admin. if your are not currently logged (or your adfs login, etc). mdocs.io is running on heroku and it uses mongodb thru mongolab and elastic search with bonsai.io (yes! searching documents works like a charm). It has some powerful key shortcuts when you are editing a document. It is built on node.js of course :). We think that Auth0 open a lot of new possibilities and we really love mdocs.io, we use it to brainstorm ideas, to write articles, documentations and a lot of other things. I have good news: I am not dead. I have been really quiet in this blog for a long time because I was not inspired to write and/or I didn't have anything important to share. Now I have lot of things to share but before that I just want to write about the last months. I left Tellago 5 months ago. I was working with a really smart team in a very interesting project called KidoZen. I started this from day zero and I gave a lot of my time and effort to make it happen. The project is still going on and I prefer not to talk about why I left Tellago here. The most important thing about my last project in Tellago is that it gave me a lot of experience in node.js, something I never used before. I contributed to various opensource things in node and I also write my stuff mostly because we needed to run KidoZen in Windows (winser and windows-eventlog). After Tellago I took some time to try new ideas on my own, while I was looking for a more stable job. I had some very good job offers but I have to admit that I am very picky about jobs now. Which is bad because at the same time I need money to live and maintain a family :). After two months or so in this situation I found an amazing and talented group of people to work with. Matías Woloski was leaving SouthWorks and planning something with Eugenio Pace. They told me about their plans and it felt like a great people to work with. I enjoy every day I work with them and I am very thankful for having this opportunity. So what are we up to? 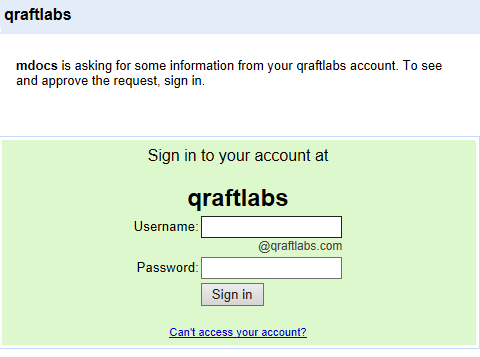 The company name is Qraftlabs which is a word that mix Quality, Craft and Lab and describes us very well. In the last few months we have been doing a little of consultancy and at the same time a new product which I think is looking great and going to be a success called Auth0. Auth0 makes it easy for small startups to sell their services to companies. Lets say you have product which is an issue tracker and this product authenticate users through users and passwords, now suppose that bigcompany.com wants to use your product but they want/need their employees to use their @bigcompany.com accounts and they want to be able to share issues with their employees. Your product will have to support some weird combinations of identity providers like office365, adfs, google (apps), etc. and also be able to query these directories. Auth0 does this for you and we have prepared a lot of docs and samples about it. If your are interested in Auth0 follow our blog and twitter.